This is a section of the meadow with about two-thirds of the flags in. The flags mark where native plant plugs have been planted. I was out in my meadow area the other day when some neighbors walked by on the path and asked, “What are those orange flowers you’re putting in?” Those are insurance — a guarantee that I won’t accidentally pull one of the native plants I’m putting in this wild area. The meadow is a somewhat neglected space that over the years has gotten overgrown with invasive or unwanted species, especially giant ragweed and my personal nemesis, wild parsnip, a nasty invasive that can lead to blisters and burning on skin that touches it. (Trust me on that one. It hurts.) Last fall, I knocked back the weeds using a combination of cutting and chemicals. I mowed the field this spring, and have been hand pulling (or cutting) regularly to keep the weeds down while my natives take root. Flats of plugs from Prairie Moon Nursery. The natives will be planted in two waves. The first are these gorgeous plants I bought from Prairie Moon Nursery in Winona. I ordered a total of 152 grasses and forbs as plugs to make sure that the meadow had a decent start. I also ordered seeds for a number of forbs (that’s the technical term for wildflowers) and have been starting those using the winter sowing method. I’m guessing it will be another two to three weeks before I get a chance to plant those. This is a big, slightly costly, work-intensive experiment, but I’m enthusiastic about it. I’m really hoping for a space that provides habitat for birds and beneficial insects as well as beauty for all the folks who walk by our garden. So far, it has inspired a lot of conversation and a few people offered tips on making sure the natives take hold. 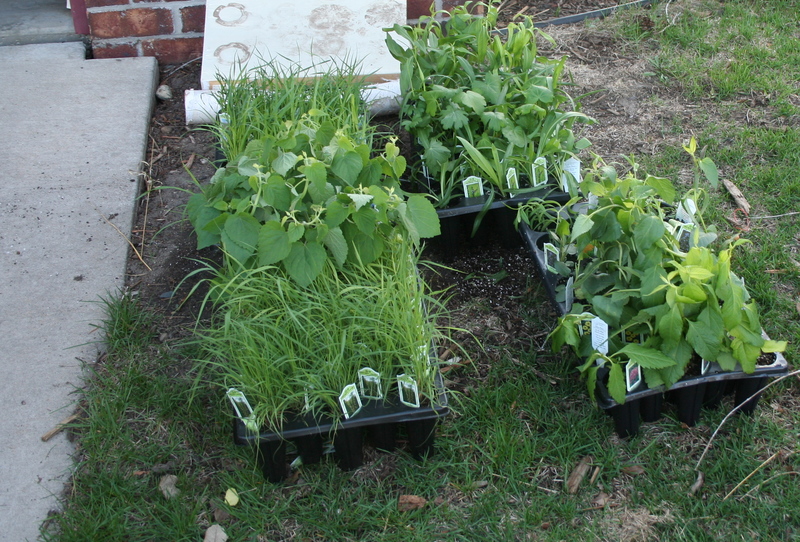 For instance, at the suggestion of one walker, I mowed a part of the meadow to make sure my plants get plenty of sun. We’ll see how things go as the summer progresses. In the meantime, if you see my orange flowers, imagine waving grasses in fall, or blooms in pink, yellow, purple and white in spring and summer that will replace them in seasons to come. This looks like a wonderful project. I just learned about Prairie Moon Nursery which does have beautiful plants.